Has Maruti Suzuki's strategy of brand differentiation made its mark beyond volume and dealer profitability to charting an up-market trajectory for its future cars? 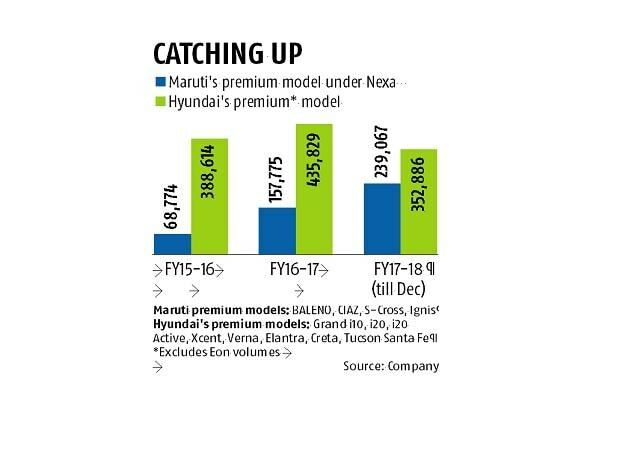 To be sure, with regards to selling cars that are priced above Rs 500,000, Maruti has been steadily closing in on rival Hyundai, which boasts of higher sales on account of a larger portfolio of premium car models. Maruti sold 239,067 cars from its Nexa outlets as compared to Hyundai's 352,886, excluding the entry-level model Eon, in the first 10 months of the current financial year. Nexa's share in Maruti's overall retail mix has been increasing - it was 19.5 per cent in the first 10 months of 2017-18, up from 10.9 per cent for the full year that ended on March 31, 2017. R S Kalsi, executive director, sales and marketing, at Maruti Suzuki, was not available for a comment but experts said the company needed to leapfrog from product dominance to overall excellence in premium brand imagery. "It (Nexa) is led purely by-products and not by promise. Take away the Baleno and Ciaz, and the Nexa network will face serious challenges," said Avik Chattopadhyay, co-founder of brand consulting firm Expereal. "There is nothing truly different and premium about the experience, except for the wooden flooring and fancy lighting. The quality of the interaction remains the same as that with Maruti Suzuki dealers, which is actually very good compared to other networks," he added. Hormazd Sorabjee, editor, Autocar India said, "Nexa has been a big propellant in Maruti's overall growth, but is not the only ticket to taking Maruti upmarket. As a brand, Maruti is just too 'mass' and does not quite have the cachet of a Honda, Toyota or even a German brand in the upper premium segment. Finding volumes beyond the Rs 1-1.2 million price point continues to be a challenge. From a brand as well as a design perspective, Maruti still needs to evolve." The company must make a concerted effort to move from conservative shapes to outstanding appealing designs, he added, citing the Ignis as a case of not hitting the right chord. "It is very funky in design, but that has gone against it," Sorabjee pointed out. There are others who give Nexa full marks. "The Nexa strategy has proved to be a game changer for Suzuki in India," said Puneet Gupta, associate director at IHS Markit, a market research and sales forecasting firm. "The positioning of the brand Maruti has gone up tremendously and has helped the firm command a premium for its products as compared to the past," he pointed out. 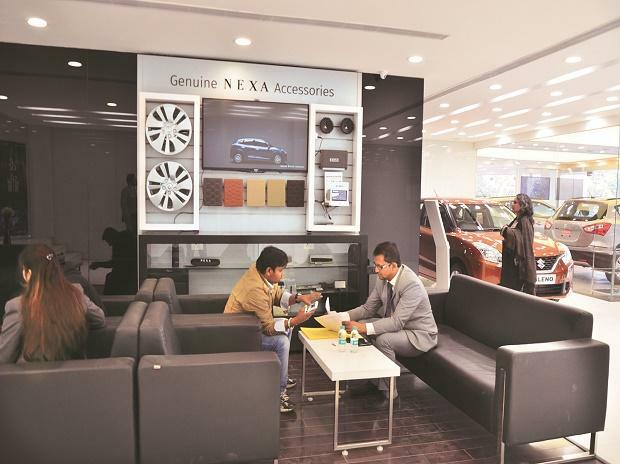 Maruti had toyed with the idea of differentiated branding earlier, but it took shape with the launch of Nexa branded showrooms in July 2013 when its network was due for a phase of expansion. This also coincided with a plan for bringing in new vehicles, including the S-Cross and the Ignis, straight out of the Suzuki portfolio. But the execution was not without hiccups. Maruti planned a premium experience to justify the higher price point and chose the S-Cross, a compact crossover SUV, to launch Nexa. The model failed to take off and dealers who had invested in the network started complaining. To get its volumes going, Nexa got the Baleno in October 2015. The premium hatchback at a price point of Rs 500,000 was a sure winner, setting the cash registers ringing in the Nexa network. This was followed by the Ignis, an urban compact, in January 2017 but that too turned out to be underwhelming. Maruti had to rethink the product and retail mix. From April 1, 2017, the company started selling the Ciaz, another bestseller, from the Nexa network but without the Maruti Suzuki badge. The Ciaz bolstered the Nexa volume. Since then, there has been no looking back for the Nexa channel and volumes have been expanding. An industry observer pointed out that the Nexa should have been a long-term strategy but in the quest for volumes, Maruti had squandered the opportunity. The Ignis had diluted the Nexa brand, he said.